Europe Automotive Electronic Control Unit (ECU) Market exceeded USD 15 billion in 2017 and is projected to grow at over 5% CAGR to 2024. The trend of offering connected mobility features in newly manufactured passenger & commercial vehicles by OEMs drives the Europe automotive ECU market development. These vehicles deploy the advanced smart & connected systems such as navigation, telematics, parking assistance, etc., which deploy several control units to support real-time monitoring features. 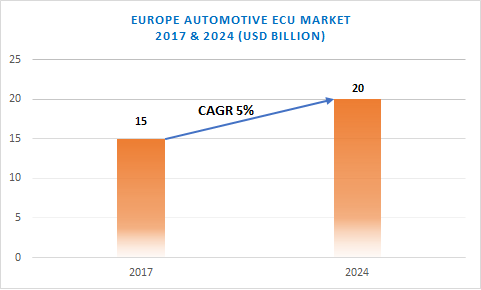 Furthermore, the growing need to promote & utilize mobility sharing services for reducing traffic congestion and environmental pollution creates several opportunities for the Europe automotive ECU market growth. Rising concerns about controlling carbon emissions and fuel consumption in highly innovative vehicle models are providing several chances for the Europe automotive ECU market development. These units are used in innovative powertrain and engine control systems that reduce the fuel consumption capacity and aid efficient engine operations. The electronic system features support EU’s initiatives to reduce road fatalities and maintain environmental pollution levels. Additionally, manufacturing strategies for developing legally & environmentally-compliant vehicles are generating several opportunities for industry growth. Semi-autonomous vehicles are experiencing a rapid growth in the Europe automotive ECU market owing to improvements in safety systems such as the implementation of airbags, parking assistance, braking systems, etc. These vehicles deploy a large number of control units to provide high efficiency to such systems, further offering increased driver safety. Moreover, increasing support from governments for the development of autonomous vehicles and permissions to conduct testing activities is also generating several chances for the industry expansion. In the Europe automotive ECU market, infotainment, & communication applications are experiencing a high demand due to their implementation in luxury & passenger vehicles. These control units provide better communication between various systems and aid the proper functioning of internet-based operations. The increasing focus on providing luxury and comfort features by leading automotive manufacturers present in European countries including Germany, Italy, etc. 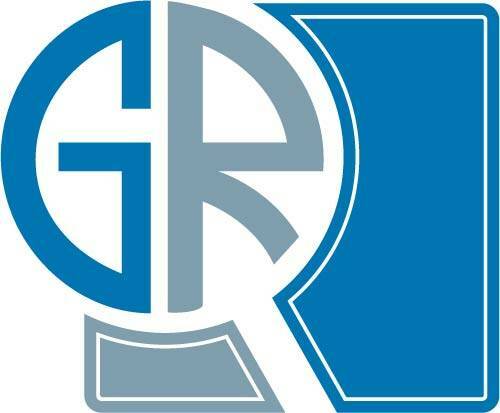 is further generating prospects for the industry development. Prominent companies in the Europe automotive ECU market include Continental AG, Delphi Technologies, Bosch Group, Johnson Control, Hyundai Mobis, Hitachi Automotive Systems, Lear Corporation, Denso Corporation, etc. These companies invest heavily in R&D activities to innovate their product & solution offerings and cover a large revenue share in the highly competitive industry.